Dolphins are fun-loving, adventurous creatures. The 40-minute Dolphin Discovery Swim at Tortola, introduces you to the dolphins and lets you spend some time with them in the water. On this interactive tour, experts will teach you about the dolphins while you swim with them and observe their behaviors. Swim with Dolphins in Tortola! You'll find many things to do near the sparkling Caribbean waters of the British Virgin Islands, but none could be more educational than the Dolphin Discovery Swim at Tortola. If you're seeking true adventure, work this one into your itinerary! Bottlenose dolphins have many similarities to humans. They are highly intelligent, love to play, and they even laugh! Wild dolphins have long been friends of the human race, even stepping in to save people from sharks! This tour is kind to the dolphins. While they have learned several tricks during their years of interaction with humans, they are wild animals. Due to their social nature, dolphins embrace the company of humans. On this tour, you'll learn from experts the many capabilities of dolphins. Your new found friends will give you a kiss on the cheek, a hug, a handshake, and do a "hand target" where they will jump up and touch their noses to your hand. You could call it the dolphin version of a high-five. They will even sing and dance by vocalizing and standing in the water. Pictures are not included, so be sure to bring your own camera if you'd like to capture these memories on film. You'll also need a passport and cash for transport, shopping, meals, towels, and biodegradable sunscreen. Transportation to St. Thomas facilities is not included, nor are other activities on the island. Be sure to show up about 30 minutes early for a quick briefing. Your family can expect a fun-filled adventure and educational, hands-on experience. Coming this close to and touching animals of such size and majesty is truly a special experience. 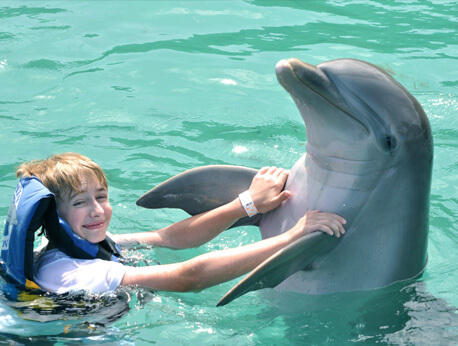 Swimming with dolphins is a once-in-a-lifetime experience that your family will never forget! Let our experts take your family on the educational adventure of a lifetime. Reserve your spot today!